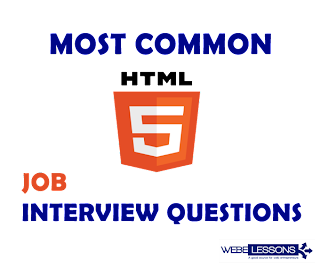 A Good Source for Web Entrepreneurs: Most Common HTML5 Interview Questions to Answer in Interview! As you Already know that HTML5 is the New Standard of HTML. The major reason to design HTML5 is to deliver almost all the things online with including any plug-in. It does everything in browsers like Music, Movies, Animations, and Apps it also can used to build most of all applications which runs in your browsers. Here are few of the Most Commons Interview Questions which need to go through once! There are many differences; HTML5 upgraded with great application development platform, whereas HTML was a simple language platform arranged with images and text on a webpage. HTML5 Included a better support for Video, Audio and Interactive Graphics, it carries a new elements, has more robust exchange protocols and also supports offline data storage for applications. Browsers can process with elements without any additional plug-ins like Adobe Flash, Sun Java FX etc. What are some of the new HTML5 markup elements? There are many Markup Elements included: few of them are; <article>, <aside>, <audio>, <command>, <details>, <figure>, <summary>, <header>, <footer>, <hgroup>, <mark>, <meter>, <nav>, <progress>, <ruby>, <rt>, <section>, <time>,<video> etc. What are new HTML 5 DocType and Charset? What are the Elements which have disappeared in HTML5? What are the Media Related elements in HTML5? HTML5 has a strong support for Media. The Tags like <audio>, <video> and the Special. There are few more A/V (Audio / Video) support media related tags which are like <source> which is useful for A/V media from Multiple sources, <track> tag is for adding test tracks to media and <embed> tag is a container for third party applications. Your browser will not support audio embedding feature. Your browser will not support video embedding feature.